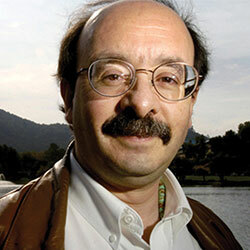 Amory B. Lovins, Chief Executive Officer (Research) of Rocky Mountain Institute, is a consultant experimental physicist educated at Harvard and Oxford. He has received an Oxford MA (by virtue of being a don), seven honorary doctorates, a MacArthur Fellowship, the Heinz, Lindbergh, Right Livelihood (“Alternative Nobel”), World Technology, and Time Hero for the Planet awards, the Happold Medal, and the Nissan, Shingo, Mitchell, and Onassis Prizes. His work focuses on transforming the car, real-estate, electricity, water, semiconductor, and several other manufacturing sectors toward advanced resource productivity. He has briefed 15 heads of state, held several visiting academic chairs, authored or co-authored 27 books (including 1999’s Natural Capitalism) and hundreds of papers, and consulted for scores of industries and governments worldwide. The Wall Street Journal named Mr. Lovins one of 39 people worldwide “most likely to change the course of business in the ’90s”; Newsweek has praised him as “one of the Western world’s most influential energy thinkers”; and Car magazine ranked him the 22nd most powerful person in the global automotive industry. To read more about Dr. Lovins, visit his personal site.